With a stay at this houseboat in Ely, you'll be within a 15-minute walk of Ely Cathedral and Jubilee Gardens. 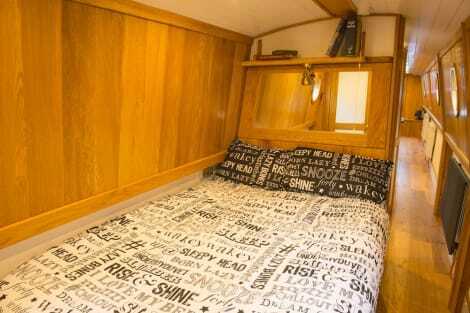 This houseboat is 15.9 mi (25.6 km) from Newmarket Racecourse and 0.5 mi (0.7 km) from Babylon Gallery. At The Lazy Otter, enjoy a satisfying meal at the restaurant. Quench your thirst with your favorite drink at the bar/lounge. A complimentary English breakfast is included. Formerly an inn from the 18th /19th century, this family-run, Ely Guest House is just 2 minutes’ walk from beautiful Ely Cathedral. Offering comfortable lodge facilities, the friendly guest house has modern, fully furnished rooms with en suite facilities. The 5 guest rooms are uniquely decorated with period furnishings and fine linens. Ely Guest House features a the garden with flowerbeds. The station and river are 10 minutes’ walk away. Located in Ely, The Old School B&B is in a rural location, within a 15-minute drive of Oliver Cromwell's House and Ely Cathedral. This bed & breakfast is 18.1 mi (29.1 km) from King's College and 19.4 mi (31.2 km) from Anglia Ruskin University. Make yourself at home in one of the 4 guestrooms. Bathrooms with showers are provided. When you stay at Poets House in Ely, you'll be on the riverwalk, within a 5-minute walk of Ely Cathedral and Oliver Cromwell's House. This 4-star hotel is 16.4 mi (26.3 km) from Newmarket Racecourse and 0.6 mi (0.9 km) from Ely Museum. Until the draining of the fens in the 17th century, this charming town was actually an island, hence the name, Ely – 'eel island'. Ely is a must-see attraction in Cambridgeshire, with its close associations with the English Civil War in the mid-17th century and as the site of one of Britain's most noSEOSITE_LEVEL_DESCRIPTION cathedrals. Book an Ely hotel with us and immerse yourself in history. The flat nature of the Fenlands ensures that Ely Cathedral is even more imposing than it might otherwise be. For this reason it has often been referred to as the Ship of the Fens. This fine Norman edifice encompasses the Romanesque and Gothic styles and within you'll be able to chart Ely's journey through nearly 1,000 years of history. The Stained Glass Museum is located inside Ely Cathedral and you'll find over 100 stained glass panels on display, dating back to the early 13th century. No trip to Ely would be complete without a visit to the home of its most famous resident. St Mary's Vicarage was the home of Oliver Cromwell and his family for 10 years in the mid-17th century. The property has been refurbished to its former glory, creating an interactive environment that shows how the Lord Protector's household operated in its heyday. Ely possesses a great deal of natural beauty and charm and it's well worth taking the time for a riverside walk or hiring a boat for a trip down the river itself. A great way to see Ely is by walking the Eel Trail which encompasses all the major sites of the town. Along the way you'll discover the lifecycle of an eel through five pieces of art depicting this slippery creature's longstanding association with this historic city. The pace of life in Ely is sedate, something that makes it so appealing to locals and visitors alike. Enjoy an invigorating brew in one of the town's many tearooms such as Peacock's or a hearty meal in a fine English tavern like the Anchor Inn or the Ship Inn. Don't miss the chance to peruse the selection of little shops that sell antiques and arts and crafts.